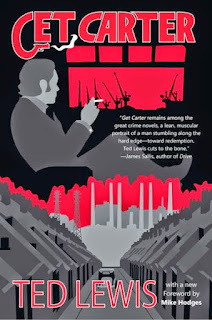 OK, so Get Carter was too good to read slowly; I finished it in one evening, and that spurred one more observation about books and movies, namely the rather obvious one that the page is a better place for getting inside a character's head than is the screen. Mike Hodges, who directed the celebrated 1971 movie adaptation of Get Carter, explains in a foreword to the new Syndicate Books edition some of the changes he made from Ted Lewis' novel. (The book was published originally as Jack's Return Home, should you find an old copy.) Hodges explained that he wanted to include locations in the north of England that had opened his eyes to poverty and social inequality during his naval service. He also wanted a more visually interesting location for a key confrontation in the novel. But he does not explain his most obvious and, arguably, most sensible choice: not to attempt a straightforward transcription of Carter's thoughts, mostly about the brother whose death he has come to avenge and that make up a large part of the novel. The movie gives us less than the book does about the dead Frank Carter, less of Jack's mix of fondness and embarrassment about his brother, almost none of the latter. That makes the movie feel less personal than the book. This is no argument for book over movie or vice versa. In this case, both are excellent. It's just a recognition that each form can do some things better than the other can. 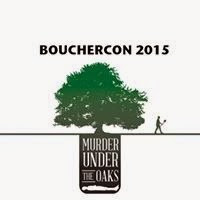 Jordan Foster will discuss Get Carter author Ted Lewis as part of a panel I'll moderate at Bouchercon 2015 in Raleigh, N.C., called "Beyond Hammett, Chandler, Spillane, and Macdonald." The panel happens Thursday, Oct. 8, at 2:30 p.m., and there is still time to register for the convention. Trust me: It's fun. Books allow me to create the location in my mind and the characters appearances. Movies can spoil the images I have created in my mind. The most recent atrocity that comes to mind is Jack Reacher. Lee Child definitely describes a character bearing more of a resemblance to actor Richard Moll, not Tom Cruise. Lee Child lost a lot of luster in my eyes for agreeing to such a casting. I haven't read Lee Child or seen the movie, but I don't know that I've seen as many character-mismatch complaints as the number I've seen for Cruise as Reacher. That's odd, in a way, because as nutty as he is, Cruise is a good actor, and a good actor probably ought to be able to overcome such physical differences. Hodges' movie version of Get Carter does a beautiful job creating a sense of place (though not always the same places Ted Lewis writes about) What it wisely does not try to do is recreate Jack Carter's thoughts about places where he and his brother had spent time in their youth. Here's another crack in Lee Child's aura: He's a pretty nice guy, mixes and mingles at crime fiction conventions. Well, one year at Crimefest in Bristol, he was one of four convention attendees on whose jackets birds crapped. I am pretty sure he was the most successful of the four crapees. I haven't read the book, but I think one reason Get Carter works is that Michael Caine is just one of those actors we love to watch in action. We don't necessarily need to know his deeper thoughts. Mary Beth: I seem to recall that Child handled the avian intrusion with great aplomb, for which he deserves a bit of admiration. Seana, one measure of Caine's performance in "Get Carter" is that I didn't mind his incongruous accent. The movie has him returning from London to his home town way up north, yet he talks as if he had never spent a day out of London. I just read the novel a couple of months ago, and you're right, Peter. You can't put it down. It contains enough British street slang to last a lifetime, some of which made me pause to try and figure out what it meant, but I didn't care. It was a terrific book. I'll be reviewing the movie in my film noir review series on Facebook in the next few days. The two biggest things books do better have been mentioned: getting inside characters' heads, and allowing the reader to create the world in his or her head. Movies have the advantage in how the shots chosen by the director and editor can push the viewer in the direction (or misdirection) they want. Movies also have an advantage because they're experienced in "real" time, so little holes that might have been evident in the book sometimes get overlooked while watching the movie. (Though sometimes they show up an hour or a day or a week afterward.) That's not really something movies do better, just an advantage they have for getting away with things. Another thing movies should do better is to cut extraneous subplots and keep the story moving. This is also a result of the time limitations, but always sticks in my mind because of how well two of my favorite screenplays do it: Jaws cuts a distracting subplot in which the police chief's wife has an affair with the marine biologist; and The Godfather leaves out all of Sonny's mistress's time in Las Vegas, which only slowed down the book. Peter, the link to the "books vs. television" post brings me back to the top of this post. 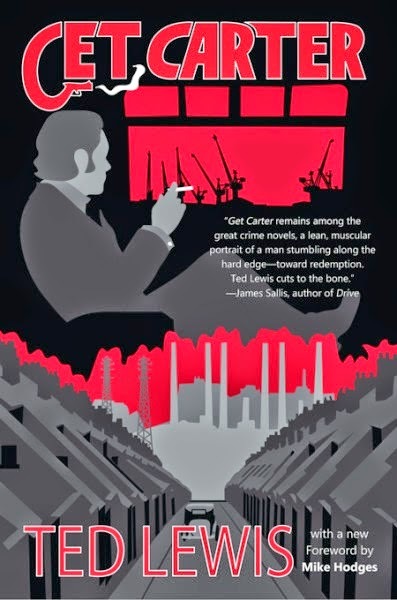 Mike, Get Carter is right up there with The Maltese Falcon among crime novels adapted into movies in which both halves of the adaptation are regarded (rightly) as classics. I always enjoy trying to guess the meaning of artfully used slang. If the author is good enough, the context will provide useful clues.